As we spend about 90% of our lives indoors, and as indoor air is 5 times more polluted than outdoor air, it is critical that we address negative effects bad air can have on our health and well-being. We want to bring clean air in every home in a sustainable way and at an affordable price compared to other air purifiers. The Italian startup Clairy continues to raise funds for its second successful Kickstarter campaign for the smart indoor air purifier NATEDE. NATEDE has already raised €500,000 during the first half of its Kickstarter campaign, which ends on June 1st. Until then, anyone anywhere in the world will be able to join the campaign and pre-order this natural and smart air purifier at a very discounted price on the future retail price. At first sight NATEDE is a plant holder, while at a better look it’s a beautiful and sustainable air purifier instead, designed and crafted in Italy. It also comes with its own stand, in pure fine wood. 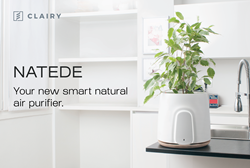 The name NATEDE comes from the combination of nature, technology and design, the tree key elements of this innovative, smart and sustainable air purifier which revolves around the natural air purifying ability of common plants. The idea comes from a research by NASA from the late ’80s. This startup team has then developed this concept and created a brand-new type of flowerpot. Plants placed in NATEDE metabolize a significantly higher amount of pollutants compared to plants potted in regular vases. The embedded technology allows NATEDE’s air flow system to quickly and quietly clean air from a plant’s soil. Its design is sleek and elegant, made in Italy. NATEDE has the ability to eliminate 93% of VOCs (Volatile Organic Compounds) and 99% of viruses and bacteria. It is equipped with advanced sensors to monitor levels of pollutants, including carbon monoxide, temperature and humidity, and It also has a photocatalytic filter, an innovative filter which does not need to be replaced, reducing waste and extra expenses. NATEDE is also an advanced technology object: it offers a variety of features, such as the monitors and sensors inside the pot, which can accurately read the temperature and humidity of a room, and have it displayed on its dedicated mobile app. NATEDE can also connect to other smart home devices, such as Amazon’s Alexa, and Google home. It even features a self-watering system, helping reduce water consumption. NATEDE is currently available on Kickstarter starting at $173 / €145. For more information about the campaign, visit pr.go2.fund/natede. Clairy.inc is an American company born from an Italian startup, Laboratori Fabrici. Clairy presented its first product at CES Las Vegas in 2016 and was then incubated for 3 months in Silicon Valley by Plug and Play Ventures, one of the most important accelerators in the world. The company focuses on health and wellness, by developing hybrid products that combine nature, technology and Made in Italy Design. Clairy is at the forefront of a green revolution, allowing users to use common plants to take control over the air they breathe. Combining the best of nature and technology, Clairy's design team has developed the best natural and smart air purifier, already awarded for its design with the European Design Award in 2017 and for its product purpose that improves health and wellness, the company received 2 Million Euro investments from the European Union (Horizon2020). Clairy is a privately held company, headquartered in Pordenone, Italy, with offices in Milan and San Francisco. The Clairy app is currently available as a free download for iPhone, iPad and Android devices globally. Clairy’s products are available for purchase in the most stylish colors on http://www.clairy.com.